Juliet Bartlett was one of the original commissioners of the Landmarks Preservation Commission and was involved with the agency’s first designations. Juliet Bartlett was born in 1898. She joined the Women’s City Club of New York (WCC) in 1933 and was elected club president first in 1940 and later in 1954. In 1941, during Bartlett’s first term, First Lady and former WCC member Eleanor Roosevelt delivered the club’s 25th anniversary address. The Landmarks Commission held its first public hearing on September 21, 1965 at 10 a.m. 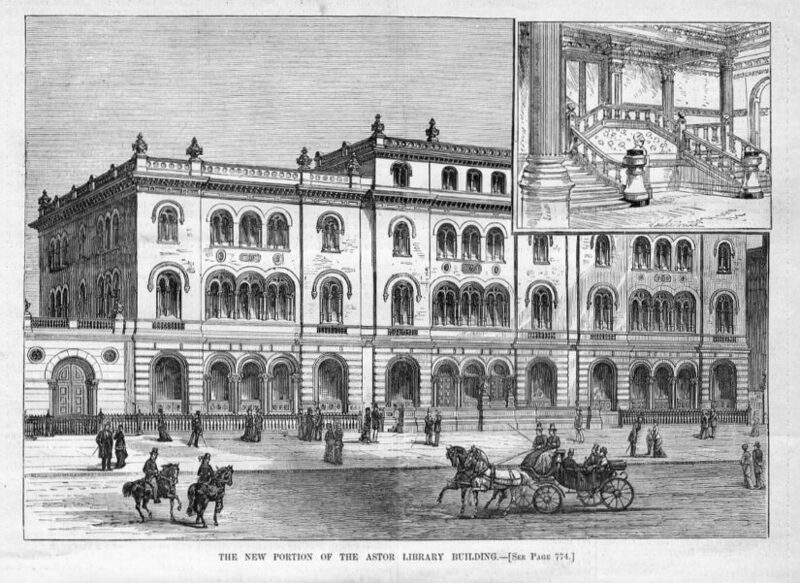 The old Astor Library on Lafayette Street was among the first sites proposed for designation.8 "This 19th-century building, based on the design of a Venetian palazzo, was the city's first major public library.”9 In 1965 the building had been sold to a developer who planned to demolish it. The Landmarks Commission arranged for Joseph Papp, producer of the New York Shakespeare Festival, to buy the building for $560,000 as an indoor complex to add to his existing success with outdoor performances of Shakespeare in Central Park. The architecture critic for the The New York Times, Ada Louise Huxtable, called it "the miracle on Lafayette Street.”10 The salvation of the Library stood as the Landmarks Preservation Commission's first major victory. The Records of the Women’s City Club of New York, Inc. 1916 – 2004, Hunter College Special Archives. ”Juilet Bartlett Obituary,” The New York Times, 15 March 1979. ”To Head Women’s Club,” The New York Times, 19 May 1954; “New Group Begins Action on Traffic,” The New York Times, 18 November 1947. Charles G. Bennett, “City Acts to Save Historical Sites,” The New York Times, 22 April 1962. “Mayor Inducts 11 Members Of Landmark Commission,” The New York Times, 30 June 1965. Frank B. Gilbert, “Papp Proved That Landmarks Law Works,” The New York Times, 13 November 1991. Christopher Gray, “The Old Astor Library, Now the Joseph Papp Public Theater; Once It Held Many Pages; Now It Has Many Stages,” The New York Times, 10 February 2002.